The widespread pain and fatigue that comes with having fibromyalgia can be debilitating. It can leave otherwise healthy people without a way to cope with their daily lives. At the London Pain Clinic we are familiar with the all over body pain, severe fatigue and sleep disturbance that is a part of fibromyalgia. In the majority of patients, fibromyalgia is the primary diagnosis but in a significant number of cases it may be secondary to an underlying condition, for example an underactive thyroid, head or neck pain. There are many of thousands of people suffering from fibromyalgia who continue to live with severe pain and tiredness because their symptoms have been misdiagnosed or inadequately treated. It is common for patients to be told there is little wrong or prescribed simple pain medication. This is one of the main reasons it takes on average 5 years for a patient to be properly diagnosed with fibromyalgia. 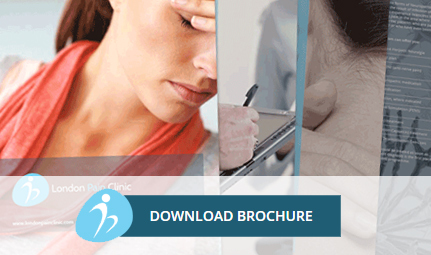 Clinical pain psychology to improve your psychological wellbeing. With an accurate diagnosis and expert treatment, fibromyalgia can be managed with the appropriate medications, physical therapy and lifestyle changes, leaving you to get on with your life. To begin your recovery, please call us on 020 7118 0250 or email the London Pain Clinic.